Four Weddings and a Funeral, even with some of its flaws, most notably the casting of Andie McDowell whom I normally love, is still a wonderful, feel-good, film led way by Hugh Grant’s charm and some heartfelt scenes. Plot Synopsis: Charlie (HUGH GRANT) is always a best man but never a groom. Determined to avoid commitment at all costs, the handsome and charming Charlie is in for the surprise of his life when he catches a glimpse of the beguiling Carrie (ANDIE MCDOWELL)… and now this confirmed bachelor is no longer so confirmed, as he finds himself caught up in the dance of laughter and love. 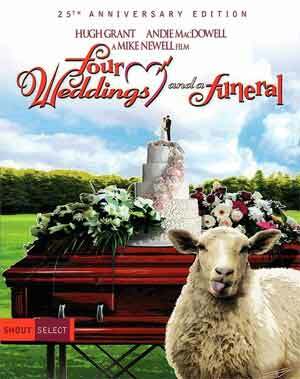 Quick Hit Review: By no means is Four Weddings and a Funeral a favorite romantic-comedy of mine. It is, however, a film that I’ve seen probably three times over the course of a decade and it is one of the more consistent rom-coms eliciting some good feelings mainly with the charismatic performances from Hugh Grant, Kristin Scott Thomas, Simon Callow and John Hannah… and reminded me that Andie McDowell was sorely miscast with a monotone in her line deliveries. Now, McDowell doesn’t sink the film, not even close, but she does tend to stick out like a sore thumb. The film was directed by Mike Newell who has always been a solid enough filmmaker if not inconsistent as he helmed one of the least favorite Harry Potter films with Goblet of Fire along with a thud of a fantasy-adventure in Prince of Persia, though Donnie Brasco was a decent enough crime-drama. Helping was Richard Curtis writing the script and it’s probably Four Wedding’s strong suite, no surprise being from the screenwriter behind Bean (both series and feature film), Nothing Hill and Love Actually (which he also helmed). This comes with a matted slip cover and the interior cover is reversible with the film’s original poster artwork. The Wedding Photographer (26:31; HD) is a new interview with Director of Photographer Michael Coulter as he discusses his work on Four Weddings and a Funeral. The Wedding Planners (29:41; SD) is an old retrospective featurette made for the MGM home video release and includes interviews with Mike Newell, Richard Curtis, Hugh Grant, Andie McDowell, and others. Four Weddings and a Funeral… In the Making (7:34; SD) is another old featurette, circa 1994, from the MGM DVD/Blu-ray releases. Two Actors and a Director (5:33; SD) are separate interviews with Newell, Grant and McDowell. Some Deleted Scenes (9:58), Promotional Spots (3:27; SD) and the Theatrical Trailer (2:08; HD) round things out. This is another near home-run of a transfer from Shout Factory, right up there with the recently released When Harry Met Sally. 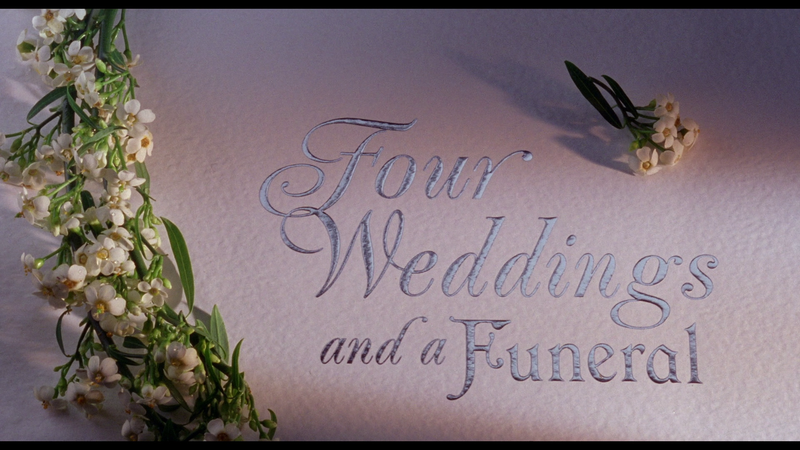 Four Weddings and a Funeral is presented in its original 1.85 widescreen aspect ratio and has been given a new 1080p high-definition transfer taken from a 4K scan of the original camera negative and boy, this does look pretty gorgeous. Detail is incredibly sharp and the natural film grain has thankfully been retained and colors are fairly vibrant. Now, I say “near” because there were a few ever-so-minor dust marks that I did tend to notice here and there, albeit nothing I would consider distracting. The disc contains what I presume is a DTS-HD Master Audio 5.1 track from the original 2011 Blu-ray release. Even so, and considering this is a romantic comedy, it is rather strong outputting good dialogue levels including some clearly ADR’d lines in a scene or two. The music and score makes up most of the depth utilizing the front and rear channels. Overall, Four Weddings and a Funeral, even with some of its flaws, most notably the casting of Andie McDowell whom I normally love, is still a wonderful, feel-good, film led way by Hugh Grant’s charm and some heartfelt scenes. This “Anniversary Edition” Blu-ray from the “Shout Select” line offers excellent video/audio transfers and a good selection of bonus material.